It has been almost a decade since The Itchyworms performed in the city-state of Singapore. The now-iconic Marina Bay Sands was still under construction, for one, and Universal Studios was probably still in blueprints. The last time the band was there in 2008, they performed in a double bill with Marcus Adoro. First, to serve as his backup band, playing songs from his seminal solo album, Markus Highway, and second, to play their own songs. The night ended in an epic extended jam on old Eraserheads songs. The years have only made the band’s wanderlust — itch, to borrow from their name — for Singapura that much more insistent. The hunger for the hawker holy grail that is authentic laksa is quite real, and so is the thirst for performing in front of new audiences, such as Singapore’s music-loving folk, whether expats or locals. Now, the band will finally get to scratch their decade-old itch for Singapore! The Itchyworms have partnered with the awesome people of Pinoy-powered events group Requiem Rising SG, to bring you an extraordinary one-night-only musical experience. All paths lead to Hero’s Bar on November 3. Whether you're hankering is for food, drink, or really good music, it’s sure to be satisfied. There will be front acts such as Pinoy indie groups Samzara and Liger. 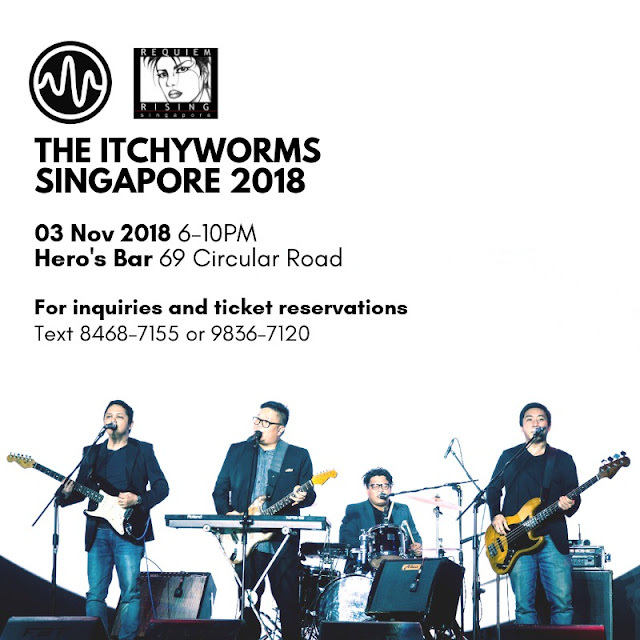 Media partners for #TheItchywormsSG2018 are Bandwagon PH, Manila Concert Junkies, Filipinos in Singapore and Pinoy Shows in Singapore.